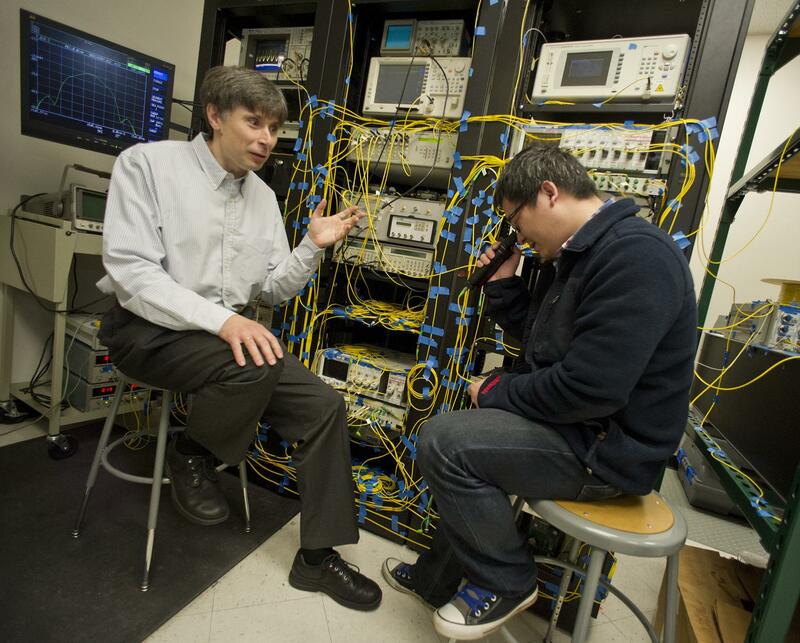 The University of Texas at Arlington, long a leader in the field of optics, will benefit from the recent addition of equipment that significantly upgrades researchers' ability to send and receive encrypted high-speed data securely through optical cables. Michael Vasilyev, a UTA electrical engineering professor, has earned a one-year, $498,981 HBCU/MI equipment grant from the Department of Defense. This grant will be used to purchase equipment to build an ultra-high-speed coherent optical/electrical signal generation and characterization platform for applications requiring very high information exchange rates and ultrafast data processing. Historically Black Colleges and Universities/Minority-Serving Institution grants are provided by the Department of Defense to fund research and education programs designed to improve the capabilities of those institutions to conduct research and educate scientists and engineers in areas important to national defense. UTA was designated a Hispanic-serving institution in 2014, when its Hispanic undergraduate enrollment reached 25 percent of its total undergraduate enrollment. Because available bandwidth is limited, companies must use very sophisticated technology to get as much out of it as possible. For a long time, wireless technology companies have been using coherent communications links, where the information is encoded in both amplitude or strength of the signal and phase or time alignment of the signals at radio frequencies. Recently, the coherent communications at much higher optical frequencies are beginning to be adopted for use by the fiber communications industry as well. The new equipment will enable UTA researchers to perform high-speed coherent communications and signal processing experiments with both optical and electronic signals, even under conditions where the received signal's phase is scrambled by environmental perturbations such as temperature fluctuations or acoustic vibrations of a fiber-optic cable buried next to a busy road. This technology has three parts: the ability to generate arbitrary electronic waveforms at very high speeds, the ability to transfer these signals to multiple optical carrier frequencies and the ability to coherently detect and digitize such high-speed signals. The third part will be implemented using a real-time oscilloscope with bandwidth exceeding 65 GHz, and the phases of the detected signals can be subsequently unscrambled by signal-processing algorithms. The new equipment will lead to higher complexity of data that can be transmitted, as well as new capabilities for non-classical communications that have not been explored yet. "This equipment will allow us to bridge the gap between classical communications and quantum communications and significantly increase data capacity," Vasilyev said. "We also hope to expand the types of projects that are of interest to local industry. There are several companies in the DFW Metroplex that want to work with us, but don't have the equipment. With this addition, we can be a one-stop shop for the local communications industry." Jonathan Bredow, chair of UTA's Electrical Engineering Department, says that Vasilyev's grant will elevate the department's status and open new avenues for collaboration with local industry, underscoring the University's emphasis on data-driven discovery contained within the Strategic Plan 2020: Bold Solutions | Global Impact. " Dr. Vasilyev has long been working at the leading edge of optics technology, and this equipment will allow him to expand his research beyond its current limits," Bredow said. "We look forward to becoming the 'go-to' institution in the region for industry's high-speed data-processing needs." Vasilyev joined UTA in 2003 after spending several years in optical telecom industry. He was promoted to professor in 2013 and is a Fellow of The Optical Society. His research focuses on nonlinear and quantum optics, optical communication systems and devices, and nanophotonics. He has earned more than $3.4 million in grants in his career and holds 10 U.S. patents. Robert Magnusson (electrical engineering) is a charter Fellow of the National Academy of Inventors and a Life Fellow of the Institute of Electrical and Electronics Engineers. He leads UT Arlington's Nanophotonics Device Group, which pursues theoretical and experimental research in periodic nanostructures, nanolithography, nanophotonics, nanoelectronics, nanoplasmonics, and optical bio- and chemical sensors. Magnusson holds 30 issued and pending patents and has garnered more than $10 million in research funding and endowments for UTA since becoming the Texas Instruments Distinguished University Chair in Nanoelectronics in 2008. Weidong Zhou (electrical engineering) is a Fellow of the International Society for Optical Engineering and holds three issued patents. His work is related to optical technology and putting lasers on silicon chips, and he has been the primary investigator on research grants totaling nearly $6 million since joining UTA in 2004. Alice Sun (electrical engineering) earned an NSF CAREER award in 2016 and has been the primary investigator on research grants totaling more than $900,000 since beginning her career at the UT Arlington in 2013. Her research interests include optofluidic biomedical and chemical sensing; nanophotonics and biophotonics; microfluidics and point-of-care devices; and bio-inspired photonic devices and systems.